Published May 4, 2013 at 307 × 203 in Clara Vulliamy (b. 1962). 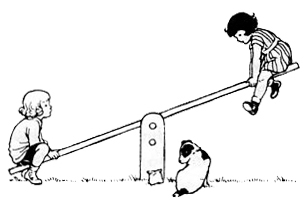 Original black-and-white line art from “Milly-Molly-Mandy Goes Errands” by Joyce Lankester Brisley, first published in The Christian Science Monitor in 1925. Reproduced in The Milly-Molly-Mandy Storybook (Kingfisher, 1996). Copyright © Joyce Lankester Brisley. The character Milly-Molly-Mandy is owned by the Estate of Joyce Lankester Brisley and is reproduced here by permission.